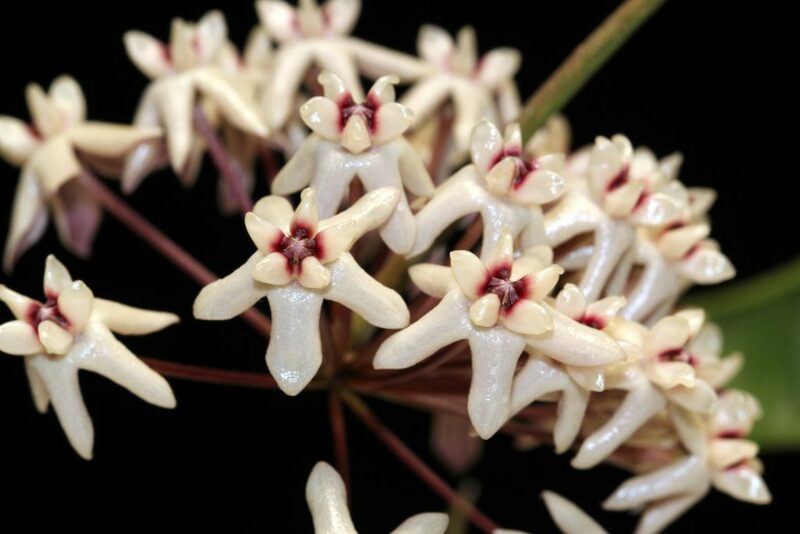 Hoya greenii was discovered on Mt. Apo, Mindanao, Philippines at an altitude of 4000 feet, on the way to Lake Hot Springs. It is named after its discoverer Ted Green by his good friend Dale Kloppenburg. Ted has brought many new Hoyas into the hobby from all over the world on his many collecting trips. He is now in his nineties, lives in Hawaii, and to my knowledge is still in good health, selling Hoya cuttings to people worldwide. The leaves of Hoya greenii are slim and pointed with a pronounce midrib. They are dark green and vary in size being anywhere from 4 to 6 inches in length (10 to 15 cm). 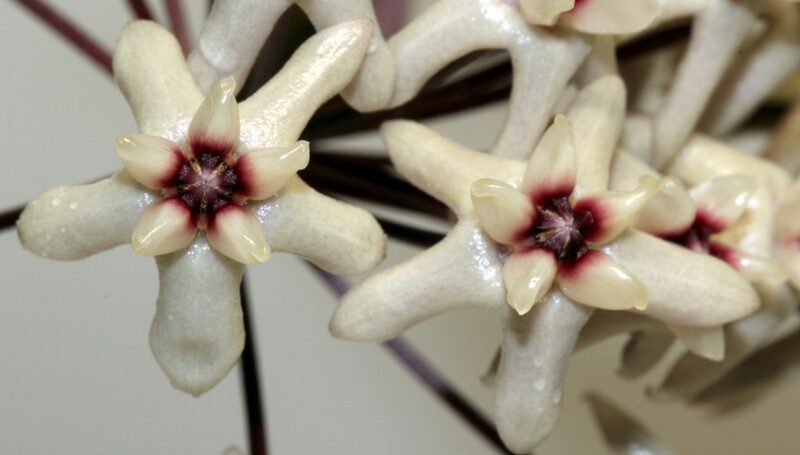 It is the only Hoya that I have grown that exhibits the strange behavior of having its flowers point upward on the peduncle as opposed to hanging down and pointing down towards the ground. It starts out normally, and then the buds gradually begin moving upwards toward the base of the peduncle. I received Hoya greenii growing in a very light weight mix, and it was bone dry when I unpacked it. I immediately watered it, but the water ran right through it. I decided to leave the plant in the mix that it came with as the plant looked so phenomenally healthy. The soil mix seems to be comprised of slivers of bark (Fines?) and small perlite. I found that I need to water the plant every two to three days to keep it happy. I test whether the plant needs water primarily by lifting the pot and hefting it. When it feels like a feather, it’s time to water. I also mist the plant daily. I attribute getting so many peduncles full of buds on Hoya greenii from growing it in very strong LED lighting. Temperatures were in the mid 70s Fahrenheit during the day light hours and upper 50s to low 60s Fahrenheit at the time of flowering. For my metric friends that would be low 20s Celsius during the day and mid-teens Celsius at night. In summing up Hoya greenii, The flowers look very similar to H. darwinii and H. mitrata, but Hoya greenii is so much easier to cultivate! If you can find the plant I urge you to pick one up as it is extremely rewarding to grow and flower.